This article is adapted from a chapter in the new book “Parking and the City,” edited by Transfers senior editor Donald Shoup, and has been lightly edited since its original publication in Parking Today magazine. Although perishable may seem a strange way to describe parking, a parking space is what economists call a perishable good. A perishable good has fixed costs and cannot be stored. Airline seats and hotel rooms are examples of perishable goods — an empty seat on an airplane or an empty hotel room cannot be stored and sold later. Like effective management for airlines and hotels, effective management for parking requires charging variable demand-based prices to ensure the spaces are used efficiently. Private operators adjust parking prices to maximize profits, but a city’s goal for curb parking should be different. Full occupancy of curb parking produces unwanted cruising, while low occupancy means the curb spaces are not delivering customers to the adjacent businesses. A city must balance the competing goals of reliable availability (one or two spaces are open on each block) and high occupancy (most of the spaces are occupied by customers). If parking demand varies over time, pricing curb parking to balance supply and demand creates a conflict between the two goals of ready availability and high occupancy. The key measure in setting prices should focus on the arriving drivers’ ability to find an open space. When Seattle began to base parking prices on demand, the City Council directed the Seattle Department of Transportation (SDOT) to “set rates to achieve approximately one or two open spaces per block face throughout the day. The policy objective is to ensure that visitors to neighborhood business districts can find a parking spot near their destination. SDOT may both raise and lower rates in different areas as appropriate to meet the occupancy target.” After the first occupancy counts in the city’s 22 meter districts in 2011, SDOT increased meter rates in four districts, left them unchanged in seven, and reduced them in 11.
Business groups supported the City Council because the City switched from a revenue goal to an outcome goal for setting meter rates. The City continues to earn revenue but raising revenue is no longer a justification for raising meter rates. The goal of one or two open spaces per block is an easy way to explain that the purpose of pricing is to guarantee parking availability and reduce cruising. Ready availability. Availability can be defined as the share of an hour (e.g., 50 minutes) with at least one vacant space on the block, so drivers can usually find a convenient open space. High occupancy. Occupancy can be defined as the average share of spaces that are occupied during the hour. High occupancy means that the curb spaces are well used and serve many customers. Revenue. Revenue depends on both meter prices and occupancy rates. Revenue should not be the primary goal, but there will be revenue if the program is managed well. Cities face a trade-off between ready availability and high occupancy. These two goals conflict because raising the meter rates to ensure at least one vacant space will reduce the average occupancy rate. Suppose, for example, a city sets prices to ensure a vacant space on each block for at least 50 minutes in each hour. If at least one vacant space is available on that block for only 30 minutes in an hour, the availability target is not met, and the price should increase. This price increase, however, means that the average occupancy during the hour will decline. San Francisco and Los Angeles set parking prices by time of day and location, and they adjust these prices every one or two months in response to the observed occupancy, although by different rules. During each time period on each block, San Francisco sets the prices to achieve a target occupancy rate on each block, while Los Angeles sets the prices to achieve a target share of the time with at least one open space on each block. Efficiency is not the only goal for curb parking management. There are other concerns, including religion. San Francisco provides an important lesson. 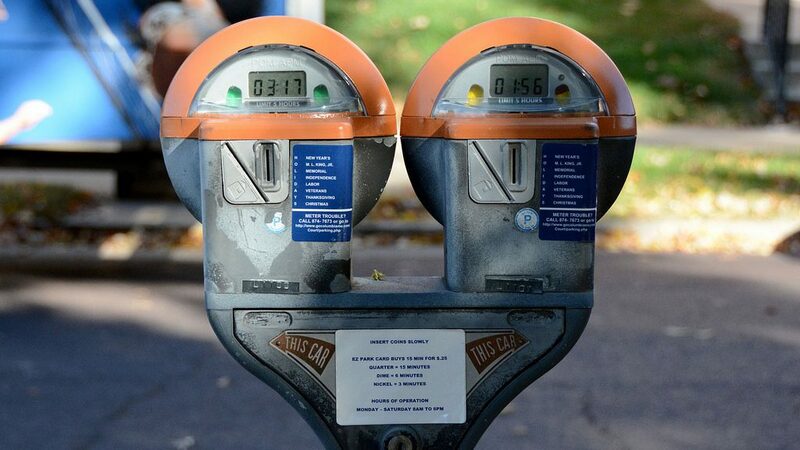 In January 2013 the city began to operate its parking meters on Sunday from noon to 6 p.m. Previously, it was hard to find an open curb space on Sunday in almost every commercial area in the city. Some drivers would park in metered spaces on Saturday afternoon and not move their car until Monday morning. After the meters began operating on Sunday, it became much easier to find curb parking on Sunday. Nevertheless, responding to complaints that church members had to “pay to pray,” in April 2014 the city resumed free parking on Sunday. If San Francisco had shared some of its Sunday meter revenue to improve public services in the metered neighborhoods, the prospect of losing public services could have generated political support to keep the Sunday metering. Merchants and residents who benefited from the public services might have insisted on the separation of church and parking. The laws of supply and demand do not miraculously stop operating on Sunday. Rock Hudson visited the Celebrity Center but stormed out when his auditor had the nerve to tell him he couldn’t leave until he finished his session, although the matinee idol had run out of time at his meter. The exemplary figure that Hubbard sought eluded capture. Equity is another concern. Although the lion’s share of parking subsidies go to people who are not poor, drivers who don’t want to pay for parking often push poor people out in front of them like human shields, claiming that market prices for curb parking will hurt the poor. This objection is either misguided altruism or disguised self-interest. Are flexible parking prices unfair to poor people? Demand-based prices for curb parking in Seattle, San Francisco, and Los Angeles all lead to lower prices and higher occupancy, which should help, not harm, the poor. And look at the bigger picture. The prices for fresh fruits and vegetables vary to balance supply and demand according the season. The prices for hotel rooms vary to balance supply and demand according to location and time of year. The prices for theater seats vary to balance supply and demand by location and day of the week. The price of gasoline varies from place to place and from day to day. Are all these and many other price variations unfair to poor people? If not, why would parking prices that vary to balance supply and demand be unfair to poor people, many of whom cannot afford to own a car? And how much money are we really talking about here? It’s only curb parking. Drivers should expect to pay for parking if they take a ton of metal with them wherever they go. Cities should efficiently manage their public real estate used for private parking. Free curb parking that now subsidizes cars, congestion, and carbon can instead pay for better public services. Charging the right prices for curb parking will improve transportation, the city, and the environment, one parking space at a time. Read more by Donald Shoup: “Optimal Pricing of Public Parking Garages” in Transfers Issue 1 and “Converting Garages for Cars Into Housing for People,” coming soon in Transfers Issue 2.